A brass quartet, canapes, champagne, mystery prizes – and a champion public speaking team! The south Wales branch of the English-Speaking Union was blessed with fine weather as members enjoyed the stirring music of the brass quartet from the Cardiff and Vale Youth Orchestra, captivating canapes from Beppe Villa of the Really Fresh Food Company, and mystery prizes from the tombola run by the ladies of Bridgend Soroptimist International. 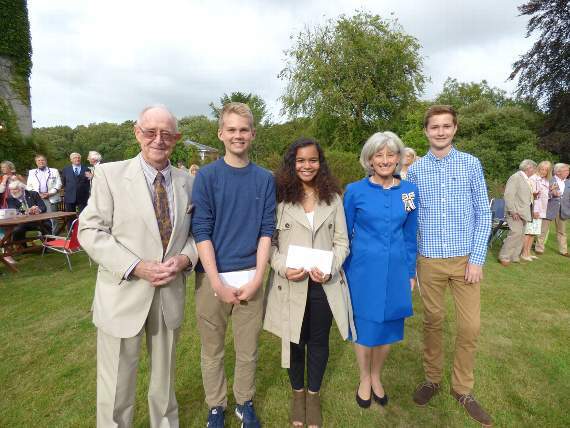 This was also the opportunity to recognise the outstanding performance of the public speaking team from Ysgol Gymraeg Bro Morgannwg, Barry, which won the Welsh Schools’ Final and went on to triumph in the UK national final at Churchill College, Cambridge, as the Lord Lieutenant of South Glamorgan, Mrs Morfudd Meredith presented prizes to chairman Twm Aled, speaker Huw Jones, and questioner Tia Roach. The quest to find the lady and gentleman judged to be dressed in the most appropriate summer garden party attire, was led by branch vice-chairman Lady Inkin and resulted in Sir Brooke Boothby presenting magnums of his best champagne to Enid Child and Graeme Morgan. Sir Brooke then added to the jollity by appearing with a giant cane and challenged all and sundry to guess the height for a modest £1 a time; amazingly Ray Taylor of Pentyrch was just half an inch away from the 24.5 foot length, resulting in Sir Brooke’s wine cellar being diminished by another magnum. With Anne Morgan organising a most generous raffle with over 40 prizes and Dr Ian Campbell dispensing fine wines at modest prices, over £1,000 was raised to help fund the next round of the Schools’ Public Speaking and Performing Shakespeare competitions, which are so valued by students, parents and teachers in south Wales. The next event is the branch AGM and lunch with author and journalist Matthew Green who will be speaking on ‘Aftershock’ on September 15, at the Cardiff City Stadium.